Many people’s ideas about religion and spirituality are shaped by the religious traditions they grew up with, and sometimes you will find people who don’t even want to use words like religion, spirituality, and worship, because they or others they know have limited the meanings to ideas they feel are negative. 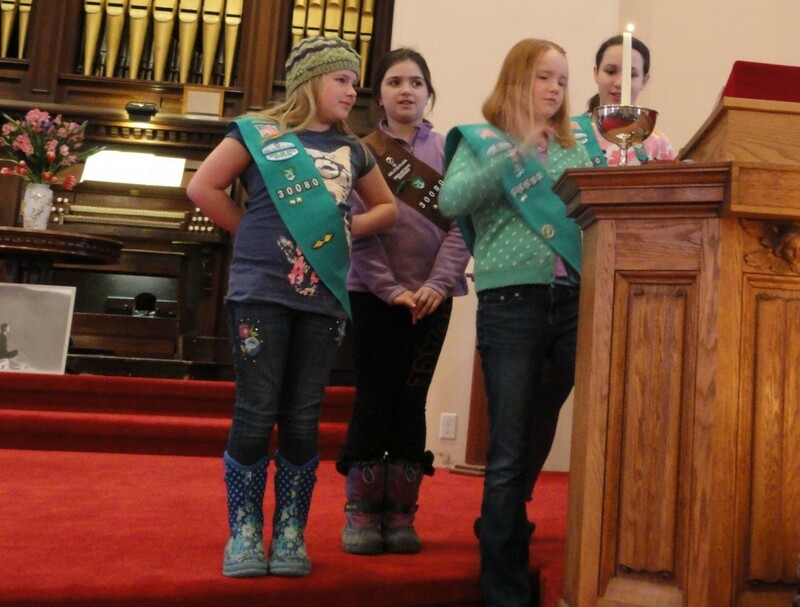 Girl Scouts lighting the chalice during Girl Scout Sunday. In this section, you will take a fresh look at the concepts “religion” and “spirituality” and consider how you think about these terms. Graduates of a Unitarian Universalist Coming of Age (COA) program might find that they have completed many of the requirements—or parts of the requirements—in this section. Great! If so, check off the requirements you completed in COA, fill in the gaps to complete others, and keep going! What is a religion? What kinds of elements commonly make up a religion? Look at this definition from the United Religions Initiative; it is written for children, but shares the neutral approach that scholars of culture and religion use. Find at least two more definitions of religion. Try looking in new and old reference sources (for example, dictionaries and encyclopedias, whether printed or electronic), finding both short and long versions (for example, a dictionary entry vs. a textbook on religion), and/or asking people who have very different religious beliefs. Compare the definitions you find. Considering each source, why do you think each definition takes the form it does? That is, why are they different? And what do they all have in common? Create a definition of your own; feel free to change it at any time. Why does it matter how one defines religion? What impact might it have if a particular spiritual tradition (say, Buddhism, Wicca, or Unitarian Universalism) was called a religion—or declared not to be a religion? Look Up faith, spirituality, and worship. Think About their roots as well as their definitions. Are some definitions more broad or narrow than others? How are these three words related to each other and to religion? How are the four words different from each other? In mainstream America, spirituality, worship, and faith are often assumed to involve concepts of “God.” What are some other possible ways to think of spirituality, worship, and faith? Ask a Unitarian Universalist minister, religious educator or someone else who has studied religion whether and how their understanding of the words spirituality, faith, worship, and religion changed while as a result of their learning experiences. Click here for Girl Scout Link A. Has our world always existed? If not, how did it start? Is there some sort of plan for humans and the cosmos? Are there worlds, seen or unseen, other than the one we live in? What comes before birth and after death? Where do humans stand in relation to other beings and forms of matter? What are people’s responsibilities and rights in the contexts of the cosmos, the world, and humanity? What do “good” and “evil” mean and how can we recognize each? How are faith and reason to be used when we don’t have clear knowledge? If you used the Tapestry of Faith curricula Riddle and Mystery or Building Bridges, you may have encountered some of these Big Questions–and you may have completed part or all of this requirement. You may wonder about some of these questions. You may already have answers to some of them. You may have considered some of these questions as part of your Coming of Age experience. Some of the questions may not make sense or be important to you, and you may have additional “Big Questions.” Your questions and answers may change over time—perhaps they have already changed! Express your thoughts about the Big Questions above in conversation, or through a written journal entry, art, music, poetry, an online blog, or other means. Then Add your own Big Questions and your thoughts about these new questions, too. It is likely that for some questions you will not yet have an answer, and that’s okay. List the questions anyway. Feel free to come back and add more questions and answers as you work on this program. To believe something means to hold it as truth. Read “It Matters What We Believe” by the Unitarian Universalist religious educator, Sophia Lyon Fahs, which has been excerpted as Reading 657 in the hymnbook, Singing the Living Tradition. In each stanza, Fahs compares kinds of beliefs, and it is clear which kinds of beliefs Fahs values and which she does not value. Notice, however, that she does not give specific examples of each. Indeed, some beliefs can have positive or negative consequences. Choose three of Fahs’ positive categories and three negative categories and Supply Examples for each. For each of your positive examples, Consider whether those beliefs could be negative in other situations or if interpreted differently. For each negative example, Consider whether/how it might be attractive to people. A creed is a statement of belief(s). Sometimes a creed is used to define a particular religion. Many denominations have creeds with which each person must agree in order to be a member. Find Out the creeds for two religious denominations. Unitarian Universalists generally say we have no creed that restricts our membership, but most of us hold in common some very strong beliefs and values, several of which we have collected in the 7 Principles. Read the Principles as written and also a version interpreted for children. Compare the Principles to creeds from two other religions, considering both their content and how they are used. A central belief in Unitarian Universalism is that a person is free to explore and decide what they believe (UU Principle 4 speaks of the “free and responsible search for truth and meaning”). Despite our common UU Principles, Unitarian Universalists can have very different beliefs about the supernatural, about right and wrong in a specific situation, about politics, and about other important matters. As individuals go through life, their beliefs often change as a result of their experiences. Although Unitarian Universalists agree to respect one another and to encourage each other’s religious and spiritual growth and exploration, many Unitarian Universalists never compose a formal statement of their own beliefs, also called a credo (Latin for “I set my heart to”). However, Unitarian Universalist youth in a Coming of Age program usually do write credos and share them with the congregation. Perhaps you have already done this yourself. 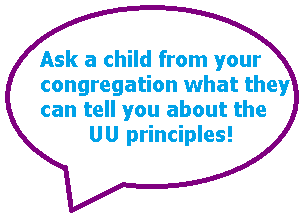 Ask at least three Unitarian Universalist adults what they believe and how their beliefs have changed over time. For one of the three, you may substitute a UU youth’s credo statement. Then, Compose a credo of your own. If you have already written a credo, Revisit that credo and Consider whether and/or how you might revise that statement today.